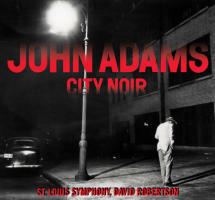 John ADAMS: City Noir (2009; rev. 2013); Saxophone Concerto (2013). Timothy McAllister (a-sax), St. Louis Symphony, David Robertson (cond.). Nonesuch 541356-2 (1 CD) (http://www.nonesuch.com/). At first blush, Adams’ Saxophone Concerto recalls mid-20th-century French ondes Martenot concertos (e.g., Jolivet, Landowski). Perhaps it’s the mood City Noir sets – which requires a first class saxophonist for treacherous obbligato passages – but most likely it’s the style. Adams is at his best when he admits nostalgia. McAllister is astoundingly busy throughout; there are more trills and squiggles (mordents, etc.) than one usually encounters in a new piece. The orchestra supports nobly, yet I’ve trouble recalling any big tunes. I would have preferred more razor-sharp crispness, or even the honeyed reverb of Stokowski’s Hollywood Bowl Symphony. City Noir is cut from similar cloth. Three connected panels satisfy Adams’ need to extend and revive his impressions of old movie cues. The gestures are immediately familiar, yet they’re Adams’ own. There’s even what sounds like a train in the last movement. Unsuk CHIN: Piano Concerto (1996-97)1; Cello Concerto (2008-09; rev. 2013)2; Šu for sheng and orchestra (2009)3. Sunwook Kim1 (pno), Alban Gerhardt2 (vlc), Wu Wei3 (sheng), Seoul Philharmonic Orchestra, Myung-Whun Chung (cond.). Deutsche Grammophon DG 481 0971 (1 CD) (http://www.deutschegrammophon.com/). Concertos are often settings for contrasts and conflicts. From the Piano Concerto’s outset we’re introduced to rapid figurations emphasizing the chattering high register. Among the four movements, the second is perhaps the most contemplative, with the remaining two rewinding the machine in preparation for a dizzying finish. Also four movements, the Cello Concerto’s gradual awakening offers a different approach to contrasts. With little in common with the Piano Concerto, again we hear bruising outbursts in an orchestration vastly more effective. Comparing the two demonstrates Chin perfecting her art. Šu takes its title from the Egyptian word for air. In an unbroken, swirling stretch, the sheng pulls and pushes through orchestral textures with accordion-like or electronic shapes, sometimes single piercing pitches. The orchestra is used most inventively to shroud and tease the insinuating soloist. 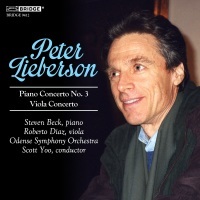 Peter LIEBERSON: Piano Concerto No. 3 (2003); Viola Concerto (1992; rev. 2003). Steven Beck (pno), Roberto Diaz (vla), Odense Symphony Orchestra, Scott Yoo (cond.). Bridge Records 9412 (1 CD) (http://www.bridgerecords.com/). The confident Piano Concerto No. 3 somehow combines Prokofiev and Brahms. Depending upon the angle of approach, it’s also possible to hear Romantic Rachmaninoff, perhaps because the piano writing is full of octaves, chords and warm small-celled gestures. Each of the three movements responds to a text: Pablo Neruda’s Leviathan, St. Francis of Assisi’s Laudes Creaturarum, and Charles Wright’s Dog Creek Mainline. Even without this awareness, the audience hears a precisely reasoned argument, colorful and detailed. The notes refer to Stravinsky’s influence, more evident in the music’s unfolding contrasts than its harmonic language. Not unreasonably, the exceptionally lyric Viola Concerto suggests the missing bars from the end of Bartók’s concerto. Diaz plays the viola with exemplary smoothness. “Orchestral Works, Vol. 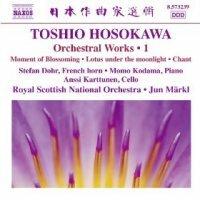 1.” Toshio HOSOKAWA: Horn Concerto, “Moment of Blossoming” (2010); Lotus under the moonlight (homage à Mozart) – Piano Concerto (2006); Chant (2009). Stefan Dohr (hrn), Momo Kodama (pno), Anssi Karttunen (vlc). Royal Scottish National Orchestra, Jun Märkl (cond.). Naxos 8.573239 (1 CD) (http://www.naxos.com/). This unassuming disc is a 2014 favorite. Having discussed Hosokawa before, I was curious to know what his Horn Concerto might sound like. Indeed “Moment of Blossoming” is one of the strangest, near-non-concertos ever. The solo horn emerges, offers long lines and hushed gestopft tones over a smooth orchestra. Perhaps the French horn is the most Teutonic of instruments: Think of rustic Strauss and Mozart. Hosokawa has created a sliver of a horn that floats over the orchestra, sometimes vanishing, sometimes emerging. I set aside much of the title’s mythology – the horn represents the lotus blossoming, the orchestra is the cosmos – and revel in the colors. Similarly, the piano concerto with its Western connotations and rigid tuning system seems an odd choice for Hosokawa. Equally strange are the brief quotes from the slow movement of Mozart’s A major Concerto, K. 488, which appear towards the end, as the composer portrays a moonlit lotus blooming and dreaming of Mozart. Yes, the flower is imagining Mozart. The effect is bittersweet and haunting as the quote evaporates over light string glissandos. Because the cello permits microtones and timbres such as sul ponticello, the Cello Concerto, Chant, easily squares within Hosokawa’s universe. But after horn and piano, the cello’s tremolo and pitch shadings seem commonplace. Here Hosokawa’s orchestra is violent and erupting. This will be a series to watch. 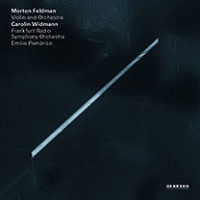 Morton FELDMAN: Violin and Orchestra (1979). Carolin Widmann (vln), Frankfurt Radio Symphony, Emilio Pomàrico (cond.). ECM New Series 2283 (1 CD) (http://www.ecmrecords.com/). Actually, Violin and Orchestra is not a concerto. Like a sand castle trying to prevail over the tides before the inevitable wave, a solo violin endeavors to upstage an orchestra. The piece mutates gradually and surprisingly. The beginning, foreshadowing Patterns in a Chromatic Field (1981), drifts into terrains which I wouldn’t have expected. It’s as if later pages are restarts, with Feldman forgetting where he is. Widmann’s work is valiant – I suspect few other soloists would consider the extra-traditional demands of this 50-minute expanse. 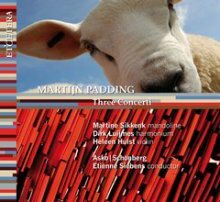 Martijn PADDING: Eight Metal Strings (2007)1; First Harmonium Concerto (2008)2; White Eagle (2009)3. Martine Sikkenk1 (mandolin), Dirk Luijmes2 (harmonium), Heleen Hulst3 (vln), Asko | Schönberg, Etienne Siebens (cond.). Etcetera KTC 1406 (1 CD) (http://www.etcetera-records.com/). Dazzling touches of populist minimalism coruscate among three lively concertos. Padding also likes triads. Modern mandolin and harmonium concertos have few if any precedents. Padding’s orchestra, mimicking animal sounds, likewise emulates pinball machines. In three tight movements totaling less than 13 minutes, Eight Metal Strings crosses bluegrass with Stravinsky. I wonder if there really is a second harmonium concerto. Is Padding making a joke about his composition’s uniqueness? It often erupts like a cartoon score. You may wonder why you haven’t heard these instruments as soloists before. In the violin concerto, two folksy movements, Quirk I and Quirk II, surround a serious statement. 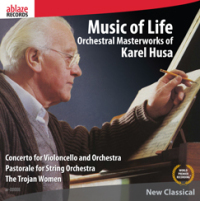 Karel HUSA: Concerto for Violoncello and Orchestra (1989); Pastorale (1979); Scenes from The Trojan Women (1980). Paul York (vlc), University of Louisville Symphony Orchestra, Kimcherie Lloyd (cond.). Ablaze Records ar-00008 (1 CD) (http://www.ablazerecords.net/). Despite the soloist’s lyrical passages, overall, the five-movement cello concerto is gritty and somber. For the third movement, Anecdote, the soloist plays only pizzicato. York makes this piece his own. A light appetizer in context, the Pastorale is a petite string orchestra piece, just over five minutes. The Trojan Women scenes return to a morose mood. This violent ballet score features adamant drums and percussion. Both the concerto and Pastorale receive their first recordings. Such seriousness may take some getting used to, but it’s rewarding. “Xenakis Edition Volume 13. 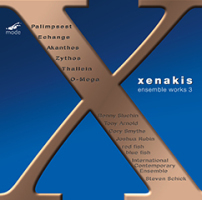 Ensemble Music 3.” Iannis XENAKIS: Palimpsest (1979)1; Échange (1989)2; Akanthos (1977)3; Zythos (1997)4; Thalleïn (1984)5; O-Mega (1997)6. Cory Smythe1 (pno), Joshua Rubin2 (b-clar), Tony Arnold3 (sop), Benny Sluchin4 (trb), Steven Schick6 (perc), International Contemporary Ensemble (ICE)1,2,3,5,6, red fish blue fish4, Steven Schick1,2,3,5,6 (cond.). mode records 261 (1 CD) (http://www.moderecords.com/). As five of these six works feature at least one player behaving as a soloist, we’ll consider this a disc of concertos. Despite modest durations, the prominent player’s efforts certainly qualify these pieces as such. Palimpsest visually enacts its title positioning the leading piano and a percussionist behind nine winds and strings. The primal percussion’s drums seem eager to escape their containers. The piece uses similar gamelan-like scales as found in the great orchestral Jonchaies (1977). Échange offers a growling solo bass clarinet accompanied by 13 winds and strings. As a pause and rewind moment, an astonishing consonant triad (E-flat major with some overtones) appears in the accompanying ensemble (near 9:30). Akanthos’ soloist is a soprano – no text, just wordless shapes. The ensemble is characteristically aggressive with quickly moving lines including the flickering voice. Zythos in its premiere recording presents a unique combination of solo trombone and six marimbas: Expressive fluctuations amid wide horn jumps meet the percussionists’ wooden patter. Thalleïn is the longest piece here, and pretty much a catalog of several of Xenakis’ interests. There is no soloist per se, although this could be called a chamber concerto. Contrasting the older Ensemble Intercontemporain version (Erato 8573-84254-2 or Erato 2292-45770-2) this version adds a minute (18:31) as well as the feeling of more space between gestures. O-Mega is Xenakis’ last composition, a four-minute percussion concerto. It’s not as exciting as Psappha or Pleïades, and aggressively tricky compositions at the end of Xenakis’ life proved difficult. The accompaniment moves more slowly and in chords (as in Échange); even so, the composer has not softened nor become easy going.